It is the biggest decision I ever have to make. It's the difference between life and death. More importantly, it's about saving 60 cents. There is a pack of Dutch Lady chocolate milk left in my fridge and I have to decide whether to drink it or throw it away. 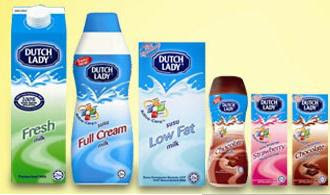 Dutch Lady is of course one of the brand names affected by China's tainted milk product scandal. China-made Dutch Lady strawberry, banana and honeydew-flavoured milk in plastic bottles were found to contain melamine - a chemical that has been blamed for several infant deaths in the 2008 Olympics host country. After getting over losing my innocence upon learning that Dutch Lady products aren't manufactured anywhere near windmills and dykes (the kind that prevent flooding, not Ellen and her bride), I'm relieved that my Dutch Lady milk, bought weeks before I even heard of a chemical called melamine, is not fruit-flavoured, bottled or made in China. Judging by the Malay words printed on the pack (which I can't read), I believe the milk is from Malaysia, which for all its political wackiness, is harmless compared to the indigestion China has been inflicted onto the world's consumers. My two children have already consumed five packs of the six-pack and they have not suffered any ill effects - yet. But my wife isn't taking any chances. As long as it says Dutch Lady, she wants to get rid of it. I won't let her. The expiry date is in 2009. I don't believe in throwing away good un-expired food. I paid $3.65 for the six-pack at NTUC FairPrice, so each pack costs 60.189 cents. Sixty point one eight nine whole cents! I can buy Lehman Brothers stock with that kind of money. My wife says she's not letting our kids drink the milk and if I want to drink it, don't go crying to her when I die. So I have a decision to make - death or throw away 60 cents? I detach the little bendy straw from the pack, unwrap it from its plastic covering and insert it into the foil-covered hole. I'm now sucking on the straw and drinking the milk, accompanied with an Oreo wafer stick. Wait a second, didn't I read that Oreo wafer sticks could be tainted as well? Good thing I didn't terminate my AIA life insurance policy. If you don't see this column next week, please tell my mother I'm sorry to be such a disappointment to her, but at least I gave her grandchildren.